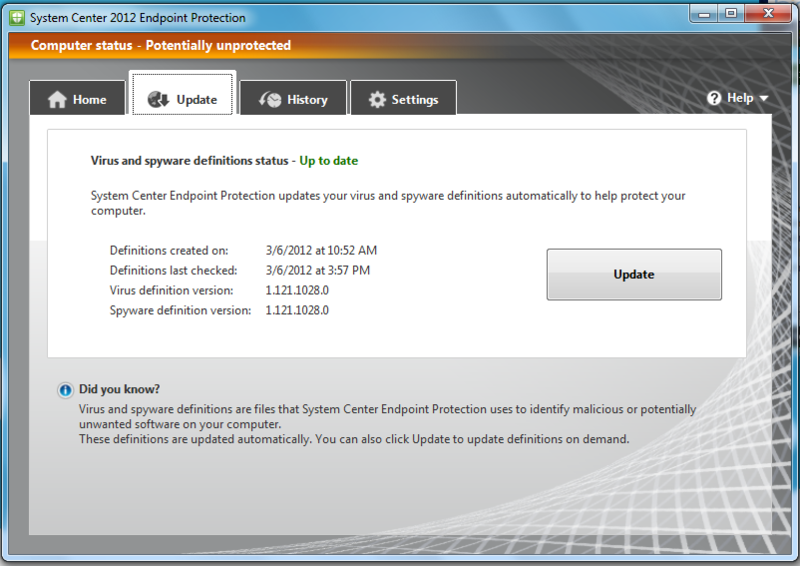 One of the primary reasons you would want to avoid naming your product something like “System Center 2012 Endpoint Protection” is the sheer confusion that would result from any dialog that it spawns. Hi, I’m Cliff. You’re here because you didn’t know that virus and spyware definitions are files that “System Center Endpoint Protection” uses to identify malicious or potentially unwanted software on your computer. I’m here because I’m just as surprised as you. Imagine, if you will, that we have an average user attempting to complete a computing task. Let’s just say they need to log into a company internal site where they can post a daily status report. Let’s now pretend that your son, who you chose for no particular reason to name “System Center Endpoint Protection”, decides to interject his personal knowledge of malware and virus definitions at the precise moment the task was to begin. Our user navigates their pointer to the blue “E” icon, clicks once in an attempt to initiate the all too familiar double click event to begin the internet related task when your son slams the door open. He spontaneously begins to inform our user not only that the virus and spyware definitions are up to date but goes on to detail the exact time and date the definitions were created along with the time/date they were last checked and the versions of each. Because your son suffers from slight autism he refers to himself in the third person when he speaks. Detailed as your son tends to be, he goes on for a period of about 5-10 minutes all the while holding up the internet related task that was about to commence moments earlier. At the conclusion of his speech, he stands there grinning with achievement and a fist anchored to each hip. Startled and confused, our user is eventually able to post the status report while Mr. Fists-On-Hips continues grinning and beaming, but not before doing one or two double-takes. I imagine such an awkward experience to be somewhat similar to my recent virus/spyware definition update on March 6th. ← Are you sure you wanna do that?